But if you are going to wear blinders then you do not know the world. yesterday, being tuesday, ms t and I found ourselves at the library. 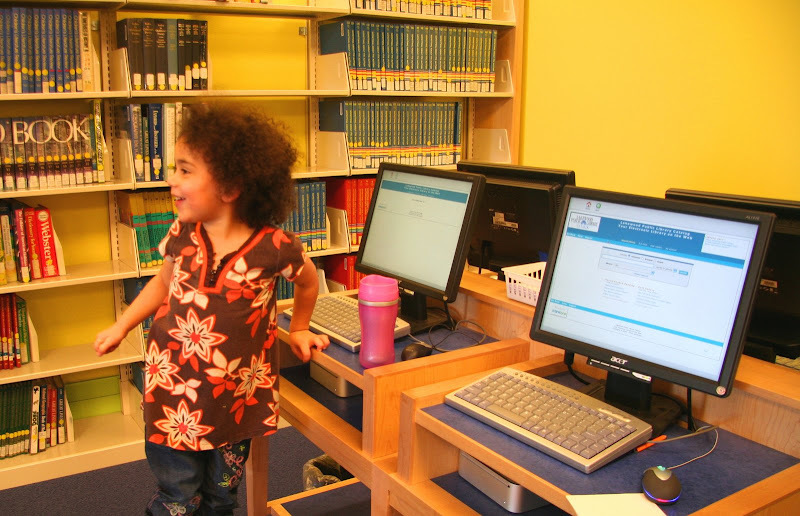 our normal library program was on break as it transitions from the 'winter' session to the 'spring' session; instead we cruised the shelves, picked out some books and spent some time playing in the librainium (the library's organic learning center). I had something to look up in the library's catalog, while I was looking up my books, ms t jumped on the neighboring computer to 'work on her blog,' at least that is what she told mr. andy and the other librarian who asked her what she was up to. needless to say, I thought we were all going to bust a gut laughing! it was a real art linkletter/bill cosby moment - kids do say the darnest things! Isn't it incredible to think of how much S. Africa has changed since then? They're more progressive than we are in many ways. Never say never! Great vid - her sax player looks a bit like our president. oh that's a great performance by Makeba (and a great bio too) - thanks for both. excellent place for her to be. she's in the best hands. What a voice! The arrangement behind Miriam Makeba for this song is also excellent. Wonderful video. i absolutely ADORE Miriam Makeba. I came to know of her through Henry Rollins, a punk musician, poet, actor, and activist. It's always a great loss when someone like her passes away. She actually passed away while on stage singing Pata, Pata. I just think it's great when someone 'goes' doing something they love. She was great, wasn't she? I sang 'The Click Song' on my way in to work this morning. Of course, I can't make the click sound. But I tried. Ditto for my mother...I loved Mekeba's spirit, a real loss to the planet. As for the adorable Ms. T, she will have many fun times and fine memories of the library and you to grow on. Way to go, kid and Kim! Ayuh, we can tell who Ms T's been hanging out with. "Working on my blog" indeed! Heh, heh! Thanks for the Miriam Makeba video. She is definitely missed, but at least she left us an extensive legacy. Ms T's comment is toooo cuuuuute! I remember the first time I heard Miriam Makeba sing, back in the sixties. Her voice was thrilling. I miss her. Years ago when Miriam was in NYC, I was going to go to her show, but she was unwell, so the show was cancelled. I was heartbroken. I had hoped to get her to autograph my LP album. She was so talented, a great ambassador. I found the bio on her life inspiring and her sojourn with Paul Simon as an advancement in spiritual evolving of our planet as a whole. Yet we have a much father journey to travel.